General Manager Jeffrey Kightlinger discusses a missed water supply opportunity in the Sacramento-San Joaquin Delta. On Wednesday, Sen. Dianne Feinstein (D-Calif) introduced an updated federal drought relief legislation. "This proposed legislation would provide much-needed funding for projects that are critical to our future. Most importantly, the bill would support California's co-equal goals of protecting the environment in the Sacramento-San Joaquin Delta and providing reliable water supplies," said General Manager Jeffrey Kightlinger. More than 100 local leaders and citizens turned out recently at the Temecula Conference Center for a Metropolitan-sponsored Community Leaders Briefing on water supply issues. The well-attended briefing heard a wide ranging discussion about regional and statewide water supply issues from California Rep. Ken Calvert (R-Corona), State Sen. Mike Morrell (R-Rancho Cucamonga), Metropolitan Chairman Randy Record and Metropolitan General Manager Jeffrey Kightlinger. Others involved in the briefing were the Eastern and Western municipal water districts, the Riverside County Water Task Force and the Southwest California Legislative Council. Commentaries by Metropolitan Board Chairman Randy A. Record, General Manager Jeffrey Kightlinger and Executive Strategist Tom Philp were recently published in the L.A. Daily News, Orange County Register and Water Deeply. Read Record's "California Needs an 'All of the Above' solution for Water" in the Daily News. Read Kightlinger’s “El Niño Doesn’t Fix State’s Broken Water System” in the Register. Read Philp’s “With Smelt It’s ‘Groundhog Day’ in the Delta” in Water Deeply. Water Tomorrow is the long-term regional water plan that looks to stabilize imported supplies, meet future demands through conservation, new local supplies and water transfers and exchanges. The plan is key to maintaining Southern California’s supply reliability through 2040. The report shows that over the years, Metropolitan investments have totaled nearly $1 billion and water saved stands at 5.2 million acre-feet. A sustained conservation ethic must continue each and every year. Read an abbreviated SB60 report. Read a more detailed report. From its groundbreaking grade school curriculum to a program hosting the nation’s largest solar-powered boat competition for high school students, Metropolitan's wide-ranging and comprehensive education program received the Governor's Environmental and Economic Leadership Award. Read the press release. 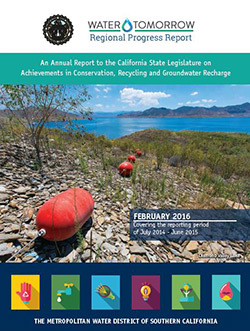 The national organization recognized Met’s leadership in promoting public outreach that crosses all demographics to promote diversity and increase water awareness during the worst drought in California’s history. The award honored the communications activities that support Met’s many initiatives to increase its workforce diversity and business outreach programs. It also recognized the quality education programs and the “Take a Turn” advertising campaign that promoted water conservation messages in five languages to a diverse Southern California audience. The partnership noted Metropolitan demonstrated "exemplary leadership in bettering the business climate and quality of life of the Inland Empire" as well as the district's leadership on water policy issues. The award also recognized Metropolitan's support for the partnership during the district's 2015 advocacy trips to Washington, D.C. and Sacramento. Other organizations honored by the partnership include the Western Riverside Council of Governments, Southern California Association of Governments, United Postal Service and KVCR Radio.